Favorite Restaurant in the World - Part 1 - Cooking With C.C. Isn’t it amazing how much food contributes to memories of different experiences. We each have moments that are etched into our memories for one reason or another. Lori and I have had some awesome opportunities to travel and experience sights, sounds and tastes in different parts of the world. I used to travel globally on business, so I’ve seen and eaten in even more places (including some memories that I would not want to repeat…….). So it is with what is our favorite restaurant and dinner experience of all times. The story begins many years ago as I learned about different restaurants and places. In one job, I had customers in New York City and I was visiting about once a quarter. I heard about many restaurants in New York – some as they came and went, but the one restaurant I heard nothing but raves about is a small place in East Harlem called Rao’s. Ah – Rao’s – I was told that it was the one restaurant in New York that you just would never get to experience. 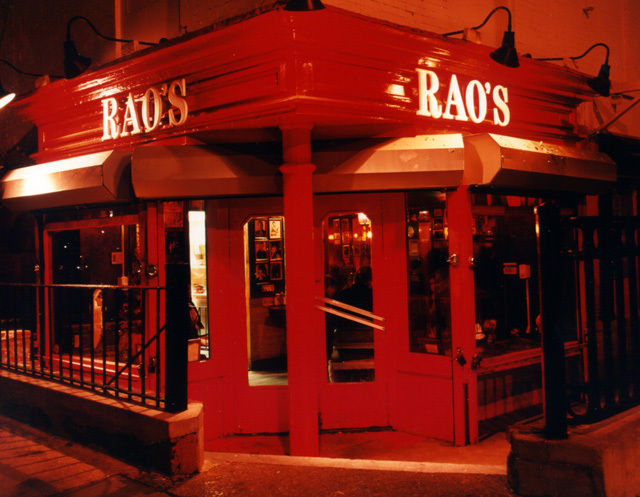 Rao’s was founded in 1886 and has changed over the years, but when Vincent Rao took the helm along with his wife Anna Pellegrino Rao, the direction was set. Rao’s is a small place with 10 tables and resisted the change to grow, move or evolve from the Italian roots. The recipes and food are what I think of in old world Italian food. I was thrilled when Frank Pelligrino, one of the current owners of the restaurant published the Rao’s cookbook. The book is as much a story of the restaurant as it is a collection of the recipes. Earlier they had branched out into distributing different products and I found the Rao’s Vodka Sauce I could get at Central Market to be such an amazing sauce. At the time, I was assisting in the Cooking School at Central Market in Austin and the quarterly schedule came out and lo and behold, Rao’s was coming to town! Now, I was ecstatic to get to meet one of the people behind this legend. I decided not to work that class and made a reservation to actually attend (I didn’t do that very often) and bought seats for a number of friends as well. The class was absolutely delicious as they cooked a number of recipes from the cookbook as well as using some of the Rao’s products along with Frank regaling us with plenty of stories. After the class, we hung back a bit to be the last folks to talk to Frank before we left. We had him sign the cookbook and if you know Lori – she of course told Frank that we like to travel to New York and was there any possible way we might be able to visit Rao’s? I’m sure Frank was asked that question a lot, but he politely said to contact them when we were coming up and he would “see what I can do…” I’m sure he didn’t expect to hear from us, but he didn’t know Lori. I made the arrangements – securing airline tickets with miles and a hotel room with points. Then two major catastrophe’s struck. In August of 2001, the company I was working for began the “death” spiral as part of the dot-com bust and I was laid off. No big worries, lots of activity until the morning of September 11, 2001. After the attack on New York, everything hiring wise shut down. We debated whether it made sense to continue on with the trip since we had no income – but since the flight was “free” and the hotel was “free” and we had reservations at Rao’s after all, we decided to continue with the plans. Since the trip was planned around the visit to Rao’s, we were going to dinner there the second night of the trip. When we were talking to the concierge at the hotel about how to get to Rao’s – he quizzed us several times about really having reservations – we made our way to the small place on East 114th street at Jefferson Park in East Harlem. When we entered, we were warmly greeted by Frank and his partner, Ron Straci (As an aside – Frank just called me “Texas”). We were there a little before 11, but the place was still full, so we went over the bar and were introduced to “Nicky the Vest,” the longtime bartender, and a number of other customers hanging around the bar. Since this was November of 2001, the attacks of September 11th were still the hot topic. Listening to this discussion, our plight with my unemployment really seemed not so significant and we never mentioned our challenges that evening. We were finally seated and one of the gentlemen I had been talking to (a regular) knew what I had to have, so he made sure the order was placed properly. We had some appetizers and our meal and just an evening (or morning at this point) to remember. The food was without a doubt the finest I had outside our trip to Italy.